Welcome to the Nelson Park Getaway! 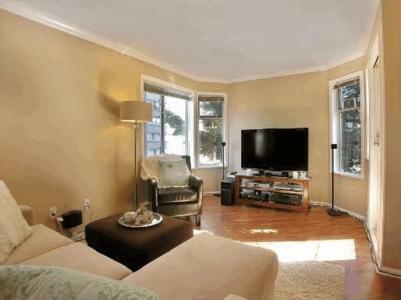 A large corner unit condo that that shines in the morning sunlight. This is a very relaxed building with only 30 units over four floors. 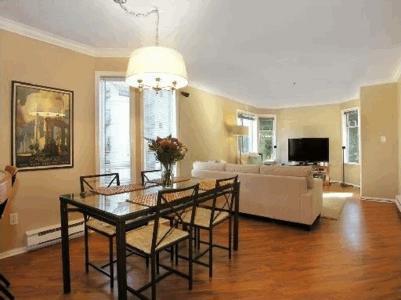 This is your urban oasis, with all the cozy comforts you will need to make a home base during the Olympics. 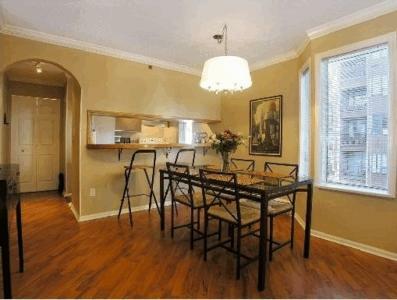 As you make your way down condo hallway, you will go up two stairs to the condo suite. There is a foyer and hallway, perfect for storing all your shoes and jackets as you enter. From the hallway are two bedrooms. 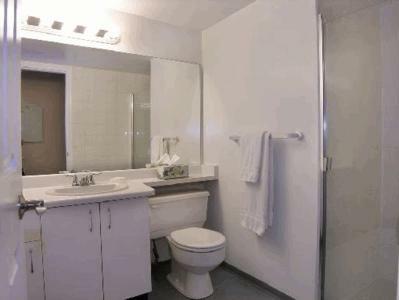 The master bedroom is very large and has an en suite bathroom with shower/tub, sink and toilet. 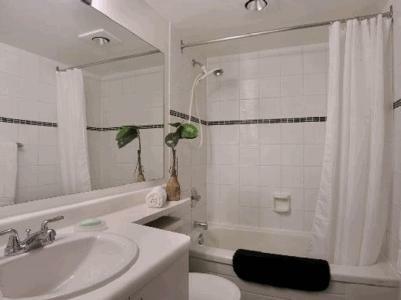 The second bedroom is down the hall, with a dedicated bathroom shower, sink and toilet across the hall. 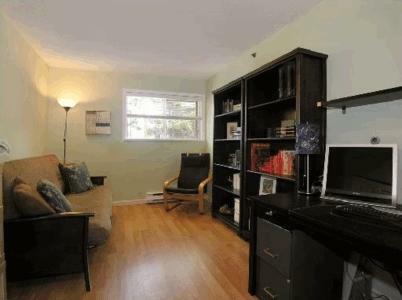 This 2nd bedroom provides plenty of space for two more people and has a very large closet area for storage. Further down the hall is the kitchen area, eating and main room. With window streaming in daylight from north and east it is a very bright area and has a large outdoor patio to the east. Kitchen has all amenities and has a bar that connects to the eating area. The main room has two leather couches, with a large HDTV, stereo system. A perfect space to enjoy Olympic events when you are not at the event yourself! The suite has a storage area behind the kitchen with washer and dryer and is perfect for storing all of your luggage during your stay. 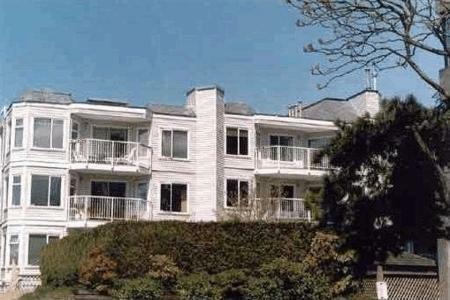 The Nelson Park Getaway is perfectly situated in downtown Vancouver. Just a 3 minute walk to the Robson Street shopping and pedestrian area, a 10 minute walk to the English Bay beaches, 15 minute walk from GM Place and a 15 minute walk into Stanley Park, you will find that all major Vancouver amenities and attractions are just steps away! Situated in the West End of Vancouver, the condo is close to Davie Street, Denman Street and Yaletown to fulfill all your food and entertainment cravings within minutes. 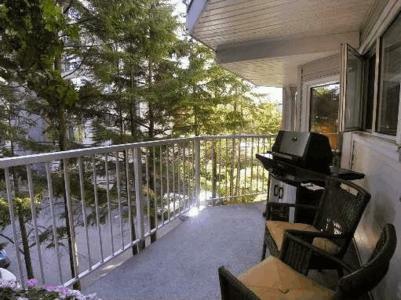 This is central living, with the Burrard Street Sky Train station just a 10 minute walk away. Through all this central living, the Nelson Park Getaway remains a quite hideaway, tucked away on a quiet, tree lined street across from an elementary school. This is the ideal setting to enjoy the events, the celebrations and the city during the 2010 Olympics. Come and enjoy a relaxed and fun-filled visit! We really appreciated the professional service and attention to detail with EMR Vacations. The reservation was met with anticipation and we were very satisfied with how the agent assured us of the location and amenities which we were great. The Olympics were a great time to visit Vancouver and we appreciated the whole experience thanks to the company providing great insight and information to us. The location was excellent and we may even try another time to visit Vancouver and use your agency when it is less busy due to the way our whole vacation was handled with EMR. The greeter was very punctual and aware of how time is important to us when travelling as we used the transit from Airport to downtown Canada line and she gave us the necessary information to ease the travel times and make it all a great experience as well. The attention to detail was above the top!! Thank you all for a job real well done.